Post: Gaurav Akrani. Date: 9/01/2011. No Comments. Label: Management. Today, there are many schools of management. There are also many management experts. Each school and each expert gives their own theory about management. They say that their theory is right, and the theories of the other experts are wrong. There are so many management theories. We cannot say, which one right and, which one is wrong. This has caused a lot of confusion in the field of management. Harold Koontz named this confusion as "The Management Theory Jungle." He has also termed it as a Jungle Warfare. Harold Koontz warned all management experts to stop this jungle warfare because of its destructive nature. He asked them to remove all these confusions. This is because if confusion exists, then management will not have universal application. So now all the management theories / thoughts / schools / experts are converging. That is, they are coming together at a same point. All the experts are agreeing with each other. 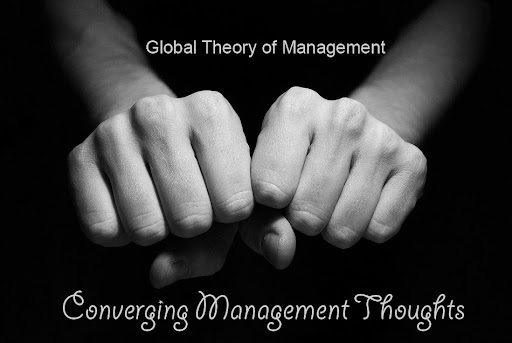 This unification or convergence of the management thoughts, now being adopted globally, is called as the "Global Theory of Management." Now-a-days most writers purify the basics. That is, they make the basic concepts of management very simple and clear. So, the trainee managers can understand the basics very easily. Secondly, whenever there is a problem, most experts first try to find out the root cause of the problem. Most experts agree that the organisation is a unified, purposeful system which consists of many different parts. The organisation is a part of the total environment. Most experts believe that we cannot have universal styles of management, which can be used in all situations. A manager must first study the situation very carefully then he must use a style of management, which is suitable for that situation. Most experts feel that the theories of motivation and leadership must be combined. They support the Follower Theory of leadership. According to the follower theory, people will follow those leaders who will help them to satisfy their wants. So, a leader will be successful only if he can satisfy the wants of his followers. Now-a-days leaders must combine both financial and non-financial motivation plans. All experts agree that technology has a big influence on management. Management has to change according to the changes in technology. Technology has a direct effect on the organisational structure, plant location, plant layout, production design and role of manpower. As the technology changes, these factors will also change. Most experts agree that the best way to teach management is to combine theory (fundamentals) and practice (case studies). Management trainees all over the world read the same management books. They also read the same case studies. They are given the same type of training. They also talk to other managers all over the world using advanced communication technology. Today, all multi-national corporations (MNCs) use the same management techniques. This justifies the emergence of Global Theory of Management. Most experts feel that Organisation Development and Organisation Behaviour are both moving towards the same direction. So, the experts are making uniform (same) theories for organisation development and behaviour. These theories are used for managing MNCs all over the world. Research all over the world, found that the management process (planning, organising, directing, controlling) is the best way to manage an organisation. So, organisations all over the world are using the management process. About twenty-five years ago, different management experts gave different meanings for the same management terms. However, now this situation has stopped. Today, management terms have same meaning in all books.